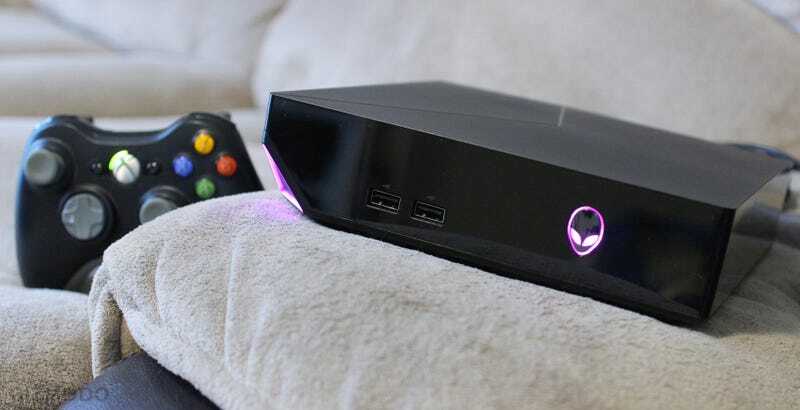 The Alienware Alpha is smaller and more powerful than an Xbox One or PS4, but the $549 Windows-powered game console shipped a little half-baked. Not to worry, says Alienware: updates are on the way! “We’re in the alpha phase of Alpha,” admits the company. When I confronted Alienware Alpha product boss Marc Diana about the issues I saw during my review, he admitted that the current product isn’t quite where Alienware wants it to be. “It’s not a full robust controller-based OS,” says Diana, “but it will be.” Alienware is committed to updating the system every single month until it gets there. “Every month we’ll eliminate the known bugs and move into feature improvements,” he says. What kind of feature improvements? Origin games. Volume controls. The ability to hop over to the Windows desktop without plugging in a mouse and keyboard (one of my biggest pet peeves). Press a button to launch the Windows 8 on-screen keyboard, complete with D-Pad support, instead of having to hunt and peck with an emulated mouse. A recovery tool so you don’t need to wait for Alienware to ship you a Windows image (or use third-party cloning software) in order to replace the drive. “In the next three months you can expect things like file exploration, the ability to map into pictures, documents, that kind of stuff,” adds Diana. But Alienware also wants you to tell them what the console should do. Every month, you’ll see a list of changes on Alienware’s support page, and you can submit your ideas there too. “As long as it’s something we can pull off in a month, we’ll do it,” says Diana, though Alienware will also entertain features that might take a little bit longer. Diana claims the Alpha will get faster, too. “I imagine into two months it’s going to be performing faster than it’s performing today, and that’s not an understatement... I’ll be pressuring the team to have significant boot time improvements.” Right now, the Alpha takes over a minute to boot, but the company’s shooting for the 22-second boot times they originally showed at E3. As far as the Alpha’s stupidly slow hard drive goes, Diana says going with a 5400rpm hard drive was necessary to hit the $549 price point, considering that the company had to pay for a Windows 8.1 license and an Xbox 360 controller for every box, but they’re looking into better alternatives too. Next year, Diana says he intends to work with “as many game developers as we can” to optimize Windows games for the Alpha specifically. Traditionally, one of the biggest benefits of a game console is a hardware spec that doesn’t change, because it lets game developers eke out more performance than they can when targeting the least common denominator. Optimization for the single Alpha spec could be a major boon. But of course, that assumes that the Alpha sells well to begin with, which assumes you trust Alienware enough to buy one. I like the Alpha, and it already plays games well. Alienware seems committed to the idea. But it’s your call whether to wait, or jump in now.